Hear us sing "Bei Mir Bist Du Schoen"
We recently recorded this iconic song from the 60's. The Swingin' Blue Stars is a group of talented singers from the East SF Bay area. We perform close harmony, swing style music made popular by 1940’s female vocal groups such as the Andrews Sisters. We sing and dance to “people-pleasing” music, mixing saucy and romantic WWII tunes that appeal to a variety of audiences, whether young or elderly. Our group was founded in December 2002 by Cynthia Shon, when our other original members had sons and daughters serving in the military and were part of the East Bay Blue Star Moms. Initially, we began singing together to relieve the stress of having loved ones in a combat theater, as well as to have something positive to do for our aging veterans. As we gained confidence in our harmony and style, we formed the Singing Blue Star Moms to share our love of music with the public. We selected our repertoire to demonstrate our appreciation for veteran’s of all wars, while increasing public support for troops currently serving in harms way. Within a few years, our high spirit, period style and swing repertoire gained a solid following in many parts of the SF Bay Area. Public demand expanded well beyond the initial Blue Star Mom “support our troops” mission, with performance requests by veteran’s organizations, community service groups, city parades, and senior communities. In January of 2011, we became The Swingin' Blue Stars. Our mission remains the same, however – we bring history to life for our audiences. We love entertaining our audiences just as the USO troops did in WWII. For many veterans in the audience, faded memories suddenly come into sharp focus when we launch into a rendition of Rum & Coca-Cola or Boogie Woogie Bugle Boy. Our performances are well-received by audiences of all ages. The growing number of engagements reflects this increase in popularity. In 2006, we gave over 40 performances with audiences ranging in size from 20 to over 1,000. 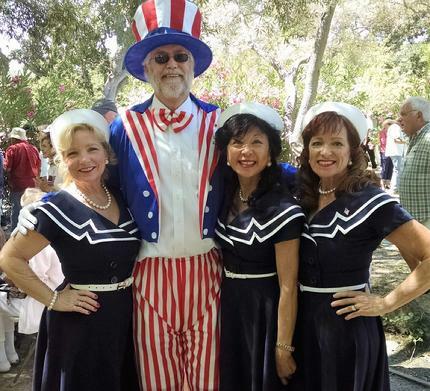 We have participated in the San Francisco Veterans’ Day Parade, 4th of July parades, the Wings of Freedom tour of vintage airplanes, the Martinez VA Hospital USO Show, the Alameda County Fair, the Concord Summer Music Series and many more.